After this manner therefore pray ye: Our Father which art in heaven, Hallowed be thy name. Thy kingdom come, Thy will be done in earth, as it is in heaven (Matt 6:9-10). No one living in Zion will say, “I am ill”; and the sins of those who dwell there will be forgiven (Isaiah 33:24 NIV). This scripture can only be referring to the spiritual Zion, the Kingdom of God, because over the approximate 2700 years since this verse was penned, there probably have been millions who have been sick in the physical Zion. As in other "Pray the Word" prayers that are on LovingGospel.com, I encourage you to search the scriptures and add your own verses to this healing prayer. We praise You Christ Jesus, our God, our Lord, the great Rapha, and the Lord that heals (Ex 15:26). 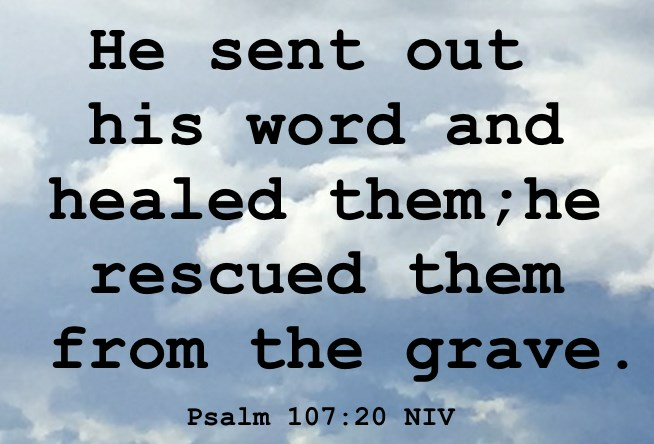 Your Word says that when we are in trouble, You save us from our distresses (Psalm 107:6) and that as Your beloved, You wish above all things that we may prosper and be in health (3 John 1:2). We know Lord that You have taken upon Yourself all of our infirmities, and have borne our sicknesses (Matt 8:17). In Jesus' name, we pray for _________ , asking that You heal their sickness, their diseases, their wounds and their infirmities. Is there no balm in Gilead, is there no physician there (Jer 8:22)? Jesus, You are the great physician, we ask You to apply Your balm and heal them. We ask You to rebuke any unclean spirits and heal Your children (Luke 9:42), in Jesus' name we pray. Lord, You have borne our grief (Isaiah 53:4) and by Your stripes we are healed (Isaiah 53:5). Lord we plead Your blood over their infirmities because You shed Your blood for us (Luke 22:20). Oh sweet Jesus, we believe that when we ask You to cast this mountain of illness into the sea that it will come to pass (Mark 11:23). Oh Mighty God, we know that You will restore health unto them, and that You will heal them of their wounds, diseases , sickness and infirmities (Jeremiah 30:17). Lord put it within them to touch your Spiritual hem, knowing they will be made whole, just like the woman with the issue of blood. (Matthew 9:20-22). In Jesus’ name, Lord we ask You to send Your Word, Your laser Word, and heal them, and deliver them from their destruction (Psalms 107:20). Oh Lord, help them trust in You with all of their heart, leaning not unto their understanding (Prov 3:5). Help them acknowledge You in all of their ways, so that You will direct their path to healing (Prov 3:6). In Jesus’ name, God please guide them and help them to do whatever they need to do to be healed as we know that You always act on our behalf, for we have seen Your glory and the miracles that You have performed (Num 14:22). Lord just as Jacob said, "I will not let You go, except thou bless me" (Genesis 32:26), Lord help them not let You go until You heal them. We know if we importune for them, You will give them what they need (Luke 11:8). Lord we ask, we seek and we knock for their health believing that You will respond (Luke 11:9). Your Word says "Is any sick among you? Let him call for the elders of the church; and let them pray over him, anointing him with oil in the name of the Lord: And the prayer of faith shall save the sick, and the Lord shall raise him up; and if he have committed sins, they shall be forgiven him (James 5:14;15). Lord, we pray that those we are praying for seek such prayer at a church that believes in healing prayer, with the anointing of oil, all in the name of Jesus Christ. As it is written, "Bless the LORD, O my soul and all that is within me, bless his holy name (Psalm 103:1). Bless the LORD, O my soul, and we forget not all of Your benefits Psalm 103:2); for You forgive our iniquities and heal our diseases (Psalm 103:3)". Heal them, O Lord, and and they shall be healed! For You are our praise (Jer 17:14). In Jesus' precious name we pray for their healing.